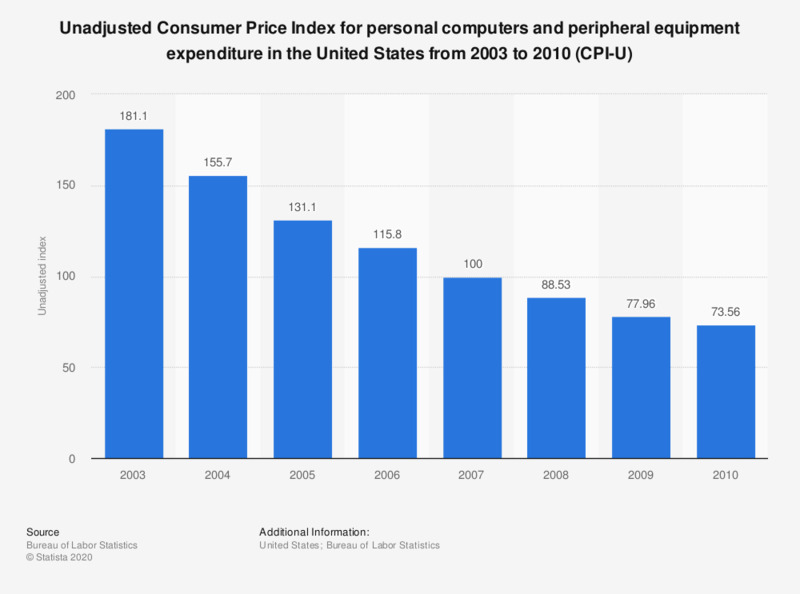 The statistic depicts the unadjusted expenditure for personal computers and peripheral equipment in the Consumer Price Index for All Urban Consumers (CPI-U) from 2003 to 2010. In 2003, the unadjusted Consumer Price Index was 181.1. Unadjusted Consumer Price Index for All Urban Consumers (CPI-U): Index on a December 2007=100 base. The U.S. Bureau of Labor Statistics (BLS) publishes CPIs for two population groups: (1) The CPI for Urban Wage Earners and Clerical Workers (CPI-W), which covers households of wage earners and clerical workers that comprise approximately 32 percent of the total population and (2) the CPI for All Urban Consumers (CPI-U) and the Chained CPI for All Urban Consumers (C-CPI-U), which cover approximately 87 percent of the total population and include, in addition to wage earner and clerical worker households, groups such as professional, managerial, and technical workers, the self-employed, short-term workers, the unemployed, and retirees and others not in the labor force.